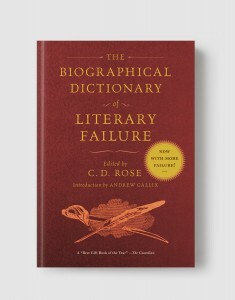 A signal event of literary scholarship, The Biographical Dictionary of Literary Failure compiles the biographies of history’s most notable cases of a complete lack of literary success. As such, it is the world’s leading authority on the subject. Compiled in one volume by C. D. Rose, a well-educated person universally acknowledged in parts of England as the world’s pre-eminent expert on inexpert writers, the book culls its information from lost or otherwise ignored archives scattered around the globe, as well as the occasional dustbin. The dictionary amounts to a monumental accomplishment: the definitive appreciation of history’s least accomplished writers. Thus immortalized beyond deserving and rescued from hard-earned obscurity, the authors presented in this historic volume comprise a who’s who of the talentless and deluded, their stories timeless litanies of abject psychosis, misapplication, and delinquency. It is, in short, a treasure. C. D. ROSE was born in Manchester at the tail end of the 1960s. 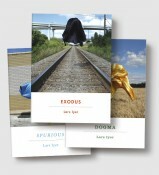 Since then, he has lived and worked in half a dozen different countries, but now resides in Norwich, in the east of England, where he went to do an MA in creative writing at the University of East Anglia, six years ago. His story “Arkady who couldn’t see and Artem who couldn’t hear” was listed for the 16:23:42/EFG Bank award (the world’s richest short story prize) in 2013, and he has been published in Granta. Ironically, a work about failure has turned out to be his greatest success. Anthony Horowitz to copyeditor: "I'M NOT CHANGING THIS."